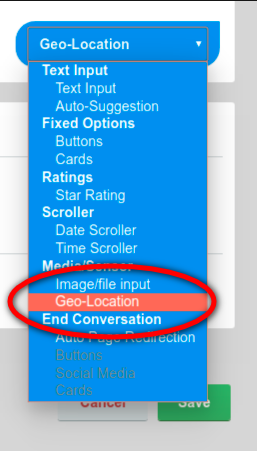 When you are asking the user for their geo-location, you may want to use a special input type called Geo-Location, which you can select from the Input type Drop Down menu. Now, once the user responds on it, you essentially collect the Lat-Long values of the location that the user has selected. In the Data section and email notification, these Lat-Long values gets transformed into corresponding Google Maps link for easy view. But you may want to access these Lat-Long values directly within the chatbot, like if you want to to send it to your API. You can do this with the similar data referencing as you do for a normal user response on a gambit, but the data scope is a bit different. Which happens to be the co-ordinates of our Office.